Although Roberto Luongo is only 3-5 in his last 8 starts, he has undeniably been the best Canuck during this recent stretch of .500 hockey. His save percentage in his last 8 games is an impressive .920 and his goals-against-average is 2.13. Luongo hasn’t allowed more than 3 goals in his last 16 starts and his focus, positioning and ability to keep the Canucks in a game has not been unnoticed, especially when he has not been getting much goal support. Ryan Kesler is having one of his most productive seasons this year. He already has a career-high of 33 goals, with 15 games to play. He has become one of the most dominant two-way players in the league and many think he will get another Selke nomination. However, with that being said, stats are stats. Kes has been in a slump, recording only 1 goal and 3 assists in his last 10 games. More surprisingly he has been a minus-player in 4 of the 10 games, which is very unlike him. Many feel that AV is playing him too much, resulting in his decreased production. With that said it should be noted that in his last 2 games he has been limited to 20:26 minutes of ice time. Hopefully RK17 can get back to his dominating self because he is an impact player that can change the course of game with one shift. The California road trip is over, but if anyone is interested in heading over to the desert, Phoenix is offering 2 regular season tickets AND 1 playoff game starting at $49. What a rip off. Do they think people are made of money? The Canucks roll into Glendale to face a team that came back from a huge 4-1 third period deficit against the 2nd-ranked Detroit Red Wings. Before that, however, the Coyotes had lost their five previous games. Phoenix is just holding onto 6th spot in the Western Conference, one point up on the Dallas Stars, who has two games in hand. The Canucks and Coyotes have split their season series so far. The Canucks won their most recent meeting, laying down a 6-0 beating of the Desert Dogs at jobing.com Arena. Ray Whitney may be small (5’10”) and old (38), but he is one of the most dangerous players on the ice every night. He Has 13 points (3G-10A) in his last 10 games and is a plus-4 in that stretch. Whitney is 2nd in team scoring with 50 points (13G-37A). The San Jose Shark’s 8-game winning streak may have to came to an end on Saturday night with a 3-2 loss to the Dallas Stars, but they still lead the Pacific Division and sit 3rd in the Western Conference. 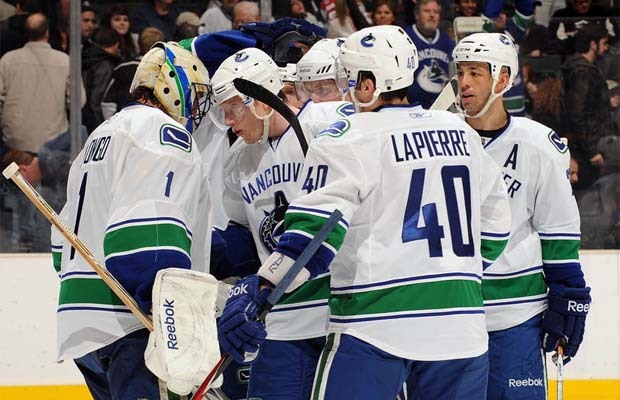 The Canucks are 2-0-1 in the season series; this is the last regular season meeting for these two clubs. Dany Heatley leads all Sharks with 3 points (1G-2A) against the Canucks this year. The “Heater” has 2 goals and 5 points in his last 5 games and is only 1 point behind captain Joe Thornton for the team lead in points. He has 53 points (22G-31A) for the season. The Flames are chasing the Canucks for the Northwest Division lead, though by chasing, I mean they have a very slim chance of catching the boys in blue considering they have a 14-point lead with 14 games left. The Flames are 7-2-1 in their last 10 games and are in 5th place for right now; however, all the playoff hopefuls behind them – the Coyotes, Stars, Kings, Wild, Ducks and Predators – all have anywhere between 1-3 games in hand. Jarome Iginla and company are 1-3-0 this season against the Canucks and have been outscored by a margin of 17-9. It might shocking to think that if one player needs to be shut down on the Flames, that player would be Tim Jackman. Yes Jackman, a bottom-six grinder, has 4 goals and 5 points against the Canucks this year, while averaging just under 9 minutes. He may only have 20 points this season (10G-10A) but according to my calculations that means he has scored 25% of his points against the Canucks. Madness I tell you, madness! The Canucks’ powerplay has dropped to second overall in the NHL, which isn’t that shocking considering they failed to score in 5 games of their 6-game homestand and have only 3 PP goals in their last 26 opportunities. They’ve had several chances in their two California stops this weekend – cashing in on one against the Ducks – so there are signs of improvement. A key factor that has been hurting the Canucks is the absence of Alex Edler. With 17 PP points (5G-12A), he was a pivotal part of the first PP unit. He was never afraid to shoot the puck from the point, and at the very least, it opened up space for the Sedins to cycle. What I’d like to see is AV change things up and perhaps put Sami “Balls of Steel” Salo on the point with Ehrhoff on the first PP unit. Next story Ask Katie about the Canucks: What’s up with AV and Rome?